Product #20739 | SKU AJ-PX270EN | 0.0 (no ratings yet) Thanks for your rating! 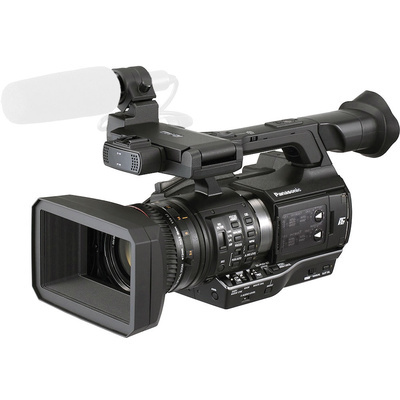 The Panasonic AJ-PX270 microP2 Handheld AVC-ULTRA HD Camcorder is a compact camcorder that draws many of its design features from Panasonic's shoulder-mounted line of camcorders. It features a 1/3" MOS imager that captures 1920 x 1080 at up to 60p and a 22x optical zoom lens, with optical image stabilisation. It records at high data rates to a variety of media, including micro P2, as well as full sized P2 media cards, while allowing you to use SDHX/SDXC media cards at lower data rates. It features a single P2 card slot, dual microP2 card slots providing a variety of recording options, and a single SD card slot for recording proxy files and camera settings. The AJ-PX270 features AVC Ultra recording, which allows expanded recording options. In addition to the standard frame rates, the camera will also record in variable frame rates at 1080p, from 1 to 60 fps in 25 steps. The camcorder features both an OLED viewfinder, and a 8.9 cm IPS LCD view screen. The lens has built-in manual focus, zoom, and iris rings, providing manual control in addition to the servo control of zoom, and auto focus and iris functions. Taking a page from the larger shoulder mount rigs, the camera features a front mounted audio input, for a camera-mounted mic, and a rear mounted audio XLR input for a second microphone. Audio level controls are at the rear of the camera, however, a second audio level control for the front XLR input is located towards the front of the camera, making it easy to adjust the level on that mic while shooting hand held. Advanced Flash Band Compensation (FBC): that compensates for dark areas in the frame that can occur when a still flash goes off, the FBC, adjusts the image to minimise the appearance of the dark areas. 12 Axis Matrix Control + 3 skin tone: Provides a 12 axis colour control of you image, with 3 skin tones control, so you can isolate and adjust your colours precisely, and protect your skin tones. The 22x optical zoom lens has a 35mm focal length equivalent of 28 to 616mm, so you have the focal range from wide to long covered. It features Optical image Stabilisation (OIS), which is necessary when handholding with a long lens. The lens also features individual lens control rings for zoom, focus, and iris. This enables manual control of your lens (in addition to servo), that is similar to the control you get on full sized shoulder mount cameras. The camera supports QoS (Quality of Service) protocols with select devices that support QoS. This allows the camera to resend packets that did not arrive. This function is dependant on the protocols supported by the available receiving device and the compatibility with the AJ-PX270. The AJ-PX270 is compatible with VW-VB batteries, such as the included VW-VBD58 battery, which is rated at 5800mAh at 7.2VDC and features a battery level indicator. This battery is not compatible with previous Panasonic cameras as it is slightly wider than previous generations of batteries. However, you can use available CGA-D54 batteries to power the AJ-PX270. The camera features a battery charger and a power supply, so you can charge a battery, while at the same time powering the camera with the separate power supply. You can even hot swap batteries provided the AC adapter is powering the camera when you do.